When laser cutting comes out, many people are turning to laser cutting for saving time and cost. It cuts components out of a sheet of metal to a very tight tolerance. So many parts to be machined before now can be laser cut. Not only metal sheet, but also brass and cooper can be cut by a modern fiber laser machine. It seems the machined process can be replaced by laser cut, but there is a critical factor that laser cut could not meet. It is the accuracy. What’s more, laser cutting machine simply could not control the thickness of the sheet. What kind of industries accuracy by precision CNC machining? Usually, the parts produced by precision CNC machining can often be used in medical, scientific or military industries. Those industries have very tight tolerances. Therefore, anywhere that accuracy of the sizes of the part is critical will need to use precision CNC machining. How to keep accuracy by precision CNC machining? Until now, the most accurate form of manufacturing we can find is precision CNC machining manufacturer. Why it can keep the accuracy of the part, since these machines are able to move in many different directions. Also the sheet steel can vary in thickness, even the same sheet can have high and low spots. For example, a customer asks for the thickness of part is 10mm, then the machinist can buy 12mm and reduce it. Sometimes, we receive some dimension of drawing is not standard sizes, then we have to buy the nearest thickness and create the nonstandard size out. How do precision CNC machine work? As we know, precision CNC machine are worked by using tools which are controlled by computers. The tools includes lathes, center drills and various other tools. They can make very accurate adjustments in all axises. It can save cost and time. Also it will makes all the parts nearly same, just very very small difference. The tolerance can reach +/-0.01, even smaller. Besides, the machine can run 24 hours a day 7 days a week without much intervention by some robotic machine. As long as the stock of material and plenty of work is enough, the machine will not stop. Just as I mentioned at the beginning, more and more people turns to use laser cut to save cost and time. But the accuracy is a problem. So for the product with holes, it will be a good idea to make the outer shape by laser cut and drill the hole by precision CNC machine. The cost will be saved too. 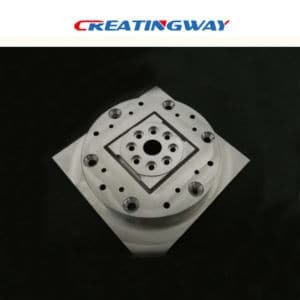 As one excellent precision CNC machining partner Creatingway will provide you best support and help, inquire us now. Call +86-0(755)-89492523 or email: [email protected]. will reply you in 12 hours.